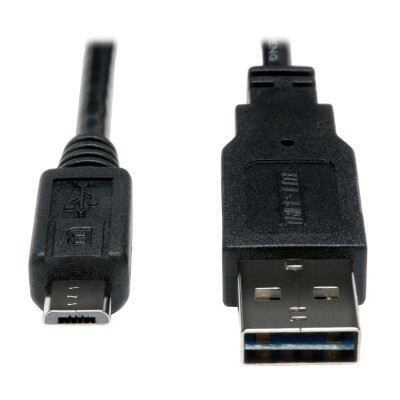 Tripp Lite's UR050-003-24G 0.31 m USB 2.0 A to Micro-B cable features a Universal / Reversible ""A"" connector, which takes the guesswork out of which way to position the ""A"" connector for plugging. Micro-USB is the latest generation of USB connector, and is found on Cell Phones, PDA's, USB On-the-Go ( OTG ) devices, Digital Cameras, Tablets and more. Constructed of premium double-shielded cable with tinned copper braid and aluminum mylar foil featuring twisted 28AWG data lines and 24AWG power lines. 24AWG power lines allow for charging of higher powered devices such as tablets, which standard 28AWG Micro USB cables can't sufficiently charge. 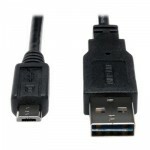 USB 2.0 rated cable handles 480Mbps data transfer rates.